Any sophisticated gentleman knows how important a good shave is. If you’re a sophisticated gentleman, you can take your morning routine to the next level by using a safety razor. The safety razor was first patented in the late 19th century and it quickly became the tool that every man shaved with. Some five decades later, the electric blade stole the spot and remains very popular. However, safety razors are a legacy that we can’t just do without. Most people prefer them for their suitability (with no batteries, you can still use them anytime, anywhere) or for their price (they’re inexpensive and replaceable). But the primary attraction for many is the superior, close shave they get from safety razors. In this post, we focus our camera lenses on Merkur safety razors. The ultimate in sharpness and durability, Merkur safety razors are mine and many others choice for the most versatile safety razor blades available. Read on to find out exactly which Merkur safety razor will suit your taste and preferences. Merkur Futur is an excellent safety razor, particularly perfect for those that are taking the plunge for the very first time. This is because it has a narrow cutting angle plus a small gap between its blade and its safety bar. This results into mild shave — with very little chances of accidental cuts and nicks. Those that are more experienced will find that the Merkur Futur isn’t as aggressive, but that’s not to say it doesn’t perform. As we all know, aggressiveness is all about personal preference. However, the best part is that with the Merkur’s Futur razor, you can shave as mildly or as aggressively as you want by simply adjusting the blade exposure. This model commonly refers to the (70) or (700) satin version, but there’s also the (701) brightly-polished version. Both have the basic chrome plating; it is the finish that differs a little. If you live in a hard-water environment, it can get difficult to keep the shiny appearance of the brightly polished chrome. As such, it’s better for you to select the satin matte finish instead. This brand of Merkur safety razor is 4.3 inches (109mm) tall and weighs 4.3 ounces (122 grams). It is a little too heavy for the standard safety razor, but this goes a long way in allowing you have a solid feel in the hand when using it. 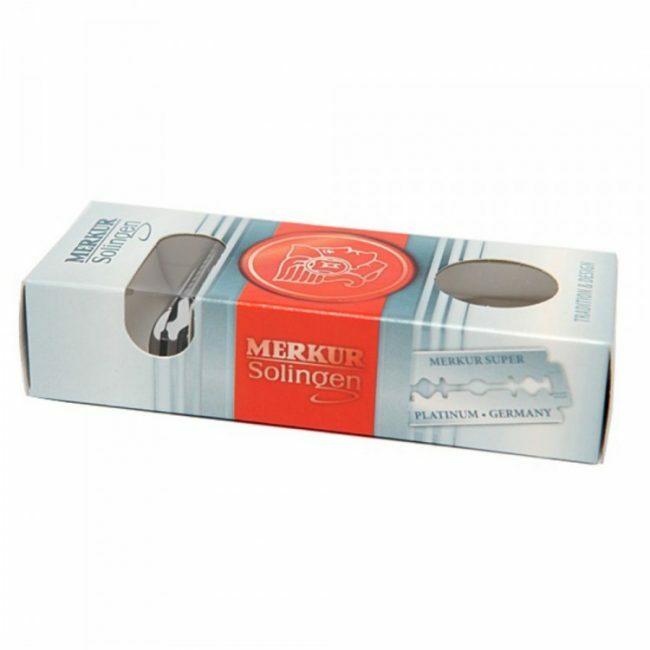 Manufactured entirely in Germany, it is undoubtedly the best Merkur safety razor ever created. The Merkur shaving gift set comes with an incredible set of thin, long handle Merkur safety razor with the bar-type guard, a chrome handle, badger shave brush, matching chrome stand; a 4 inch polished chrome shave bowl and one cake of shave soap. The razor, handle, stand and bowl are made entirely of chrome which we know is nicely balanced and feels just okay in hand. It’s neither too heavy nor too light to the extent that you can get somewhat careless with it. The blades fit perfectly without any movement once they are fixed, and removing it for replacement is a breeze. The handle is just about 4 inches, while the shave bowl is a little over 4 inches. This combination ensures that the set is as comfortable as it gets. The key to this double-edged safety razor are the innovative blades that Merkur is well-applauded for. They’re perhaps its single greatest strength-extremely sharp and built to be entirely effective and efficient. You shouldn’t worry about the blades being too sharp, thanks to the narrow gap between its blade and its safety bar, the end product is a close and comfortable shave you’ll ever get. The holder is great, the brush is on-point, the bowl is even better. However, the soap you get with the set is glycerine soap. If you’re not a fan of glycerine soap, you can always replace it with a more convenient one. All things considered, this gift set is the best Merkur safety razor you can buy for a loved one. You won’t regret it. This Merkur safety razor isn’t as pricey as the Merkur gift set, but you won’t notice any difference in quality. It has the feel of luxury, and it performs better than blades with a $300 price tag. It is well balanced, more ergonomic in your hand and just feels good when put to use. 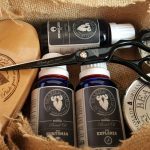 Its weight is perfect, really ideal if you have a very thick beard. Believe it or not, it outperforms a fusion cartridge in a single shave. Additionally, it’s not too heavy like other Merkur safety razors. At a little over 5 ounces, you can be sure that it feels right holding it and even better using it. The adjustability of this brand is excellent in every way. 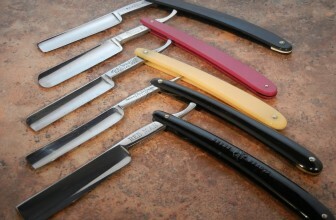 By simply fine-tuning the upper part of the handle, you can change the angle of the blade inside the razor. This gives you the chance to have the most comfortable shave you’ve ever had. From a nearly impossible to cut yourself angle to an angle needed to maintain a really close shave, this Merkur safety razor outdoes itself. The best part is that the handle is a little over 4 inches while the razor is a little under 4 inches. The combination gives you an incredibly smooth shaving experience, allowing you to shave exactly how you wanted unless you intentionally adjust positions. If you are a safety razor fan and want a closer, smoother shave, this is the razor to choose. Compared to many other Merkur safety razors (Futur, Progress, and Vision), Merkur Progress Adjustable Double Edge Razor with a Pack of 10 Blades is definitely a winner. 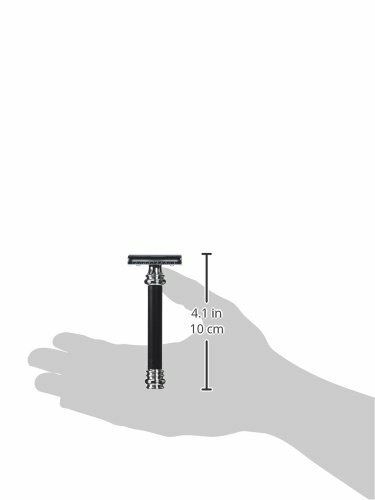 With a heavy duty razor, an adjustable head and a short handle, it is perfect for a pro-shaver. The one problem is that the smooth and short chrome-plated handle can become a bit too slippery if you use gel or water on it. Yet, its balance is still perfect, and any pro can never go wrong with it. What’s more — its pack of ten blades will save you a whole lot money. Since it’s manufactured to be both mild and aggressive with a narrow gap between its blade and its safety bar, you need not worry about cuts or nicks. All you have to do is find the adjustment position that works well for you. One user mentioned that he uses 3.5 to 4 inches on the first pass, 2.5 to 3 inches on the second and third pass and finally 2 inches on the last pass. Then he re-lathers and repeats the shave at level 3 or higher. With this method, he claims to have a clean and close shaving experience that lasts up to 48 hours (for a regular shaver). Unlike cheaper models where you have to go over an area over and over again, two or three passes with this razor and you are ready to go. All things considered, this progress adjustable Merkur safety razor is certainly a winner. Progress razor; adjustable head; short handle; heavy duty razor; best merkur razor on the market plus travel case! The Merkur progress long handle adjustable is the latest addition to the Merkur household and has already earned its place as a top performer. 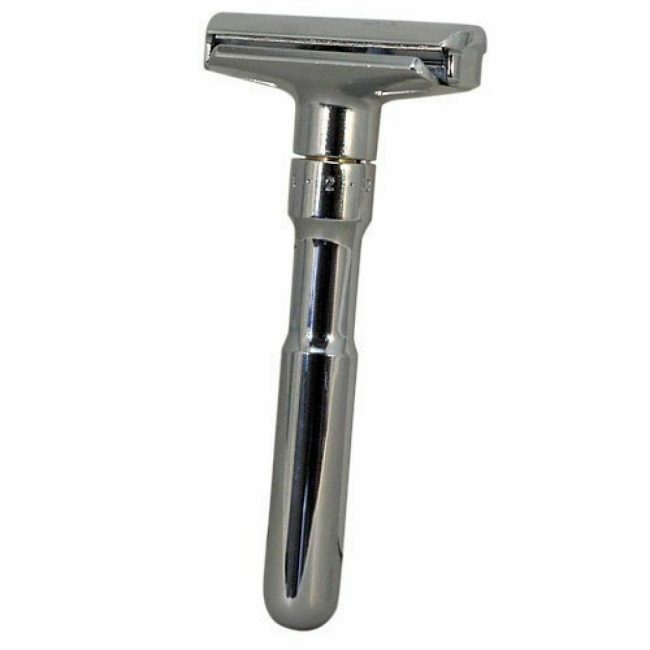 It has a beautifully contoured and long handle, giving you more control and flexibility over every shave. The angle of its blade can be fine-tuned to suit your preference by simply twisting the handle to one of the 6 settings on the razor. This razor has a perfect weight, an excellent balance and is aesthetically pleasing. Its price is a bit high if you’re new to this area of shaving, but pretty reasonable if you’re not. At the end , only time will tell if you made a worthy investment or not. After all, everything is about preference. One major concern for most users is the polished finish. There is a high possibility that you may lose the hold of the razor due to its incredibly smooth finish. Experienced users might never have this issue, but the potential is there if they lower their alertness. The adjustable settings range from one to six, and this is in reference to the gap that exists between its blade and its safety bar. Setting 1 gives you the narrowest gap which is less prone to nicks, bruises, and cuts. Setting 6 is ideal for big beards, or for those that prefer a very close shave, allowing more skin to get trapped between its blade and its safety bar. 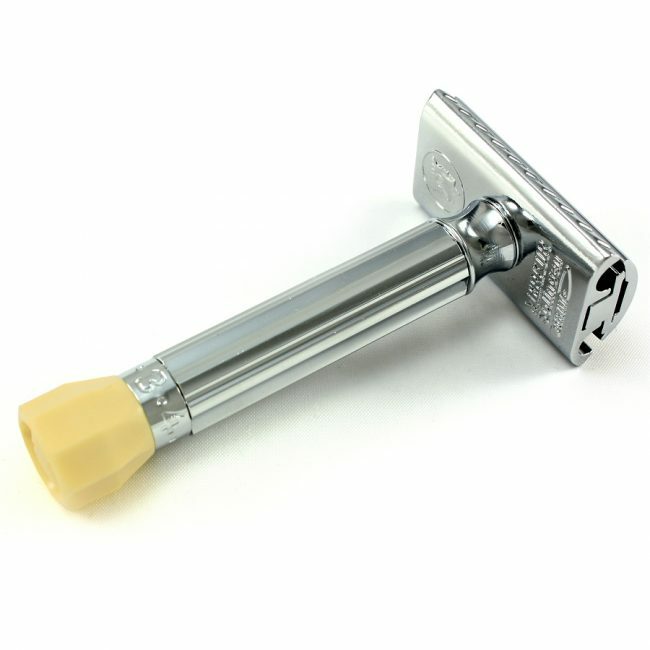 Without a doubt, it is also the best Merkur safety razor on the market today. With the polished finish, there is a high possibility of cutting oneself when using it. The Merkur Futur double edge razor creates a smooth skin using an old school tool. 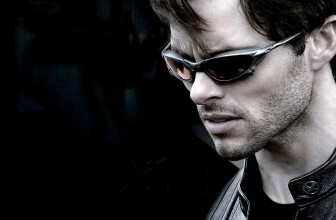 In short, the Futur shaves much closer and smoother than any other two, three, four or five blade razor. Of course, it also outperforms the electrics — both foil head varieties and rotary. The best part about it is that it is adjustable and incredibly simple to load and unload. However, its smooth handle could be a little slippery, but this is well catered for in that it has a pretty long handle. Without using much effort, you are guaranteed of a really comfortable shaving experience. While its handle is smooth, pro shavers will not have a problem with the slipperiness. Newbies can simply remedy this by installing a grip tape for a firmer hold. The perfect, curved shape of the head allows the blade to quickly and effortlessly slide from your nose all the way to your neck. There are no gymnastics required. Just push it up and slide it down. The one area where Futur lags behind other brands is time. It takes a lot of time to get used to shaving with a double-edged razor. However, if you’re used to this, it shouldn’t take you long. You can learn how to perfect your shaving skills on YouTube, or just learn on your own as you better your skill. With that said, the Futur double edge razor is definitely a contender worth checking out in the Merkur safety razor category. The Merkur adjustable Futur safety razor features a contemporary and stylish look. 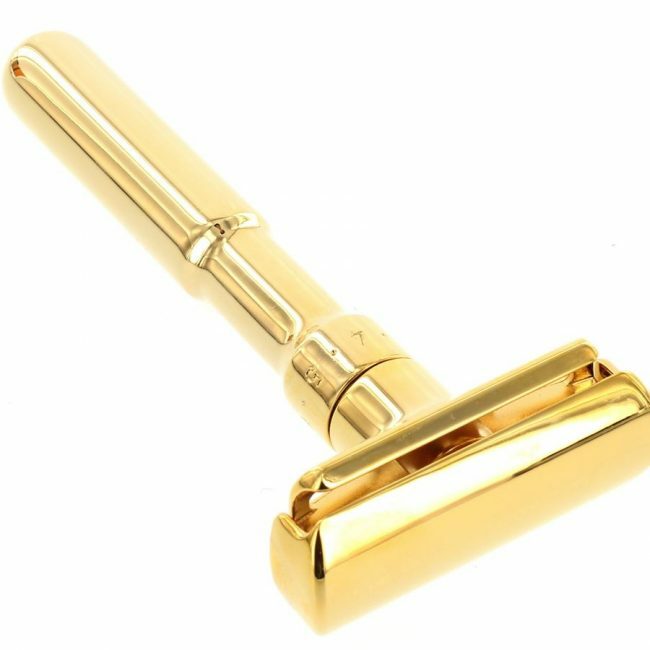 Its smooth and beautiful finish across the planetary of the razor without the standard patterns of grip on the handle makes it extremely comfortable to the touch. It has a bulkier head and a longer handle when compared to traditional short razors, thus making it a natural fit for people with longer hands and those who prefer the feel of a long blade. With a weight of 5 ounces, it provides a comfortable heavy and solid look sought after by many pro shavers. Moreover, its snap-on head ensures that the blade is secure, thus preventing it from shifting around when in use. The head allows a user to easily fine-tune the aggressiveness (sharpness) of the razor. Its handle bears numbered adjustment settings from 1 to 6 divided by distinct marks between every number. When you turn the handle, the head is either raised or lowered, revealing a smaller or larger gap between the safety bar and blade. The smallest gap is at setting 1, the most aggressive (sharp) is at 6. If you’re a newbie, it is advisable that you start with setting 1 before gradually increasing the blade angle to find a setting that satisfies your shaving needs. One problem that has been reported by some users is that the large head can become problematic when trying to shave small areas of skin, such as the nose. The large head can become problematic when trying to shave small areas of skin, such as the nose. 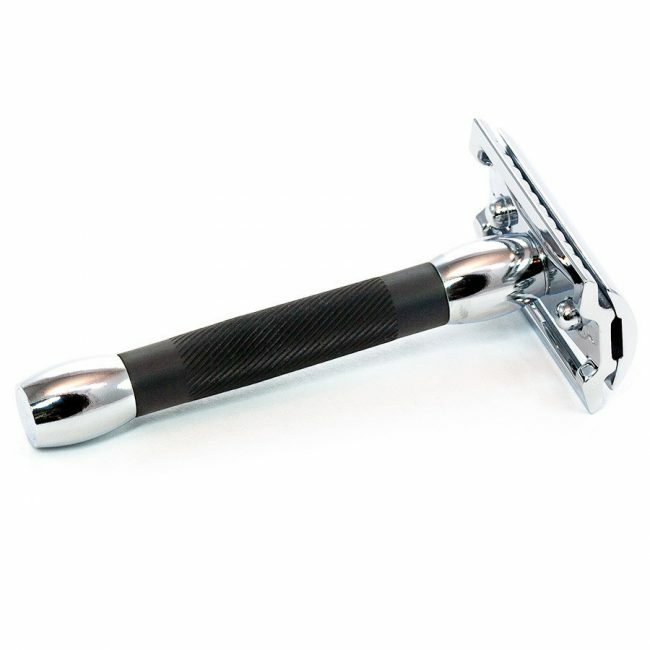 Featuring a classic 38 HD model barber pole, this razor has a hefty black handle with a solid chrome finish. Constructed to look like American barber poles, this weighty yet balanced 2-piece razor measures 3.74 inches in length and weighs a little over 4 ounces (120 grams). This added bulk means that the weight of the razor alone does all the shaving work. 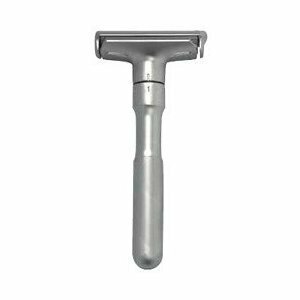 Merkur Heavy Duty Long Handled Barber Pole Safety Razor has an etched chrome finish with a regular head that fits all Merkur safety razor blades. 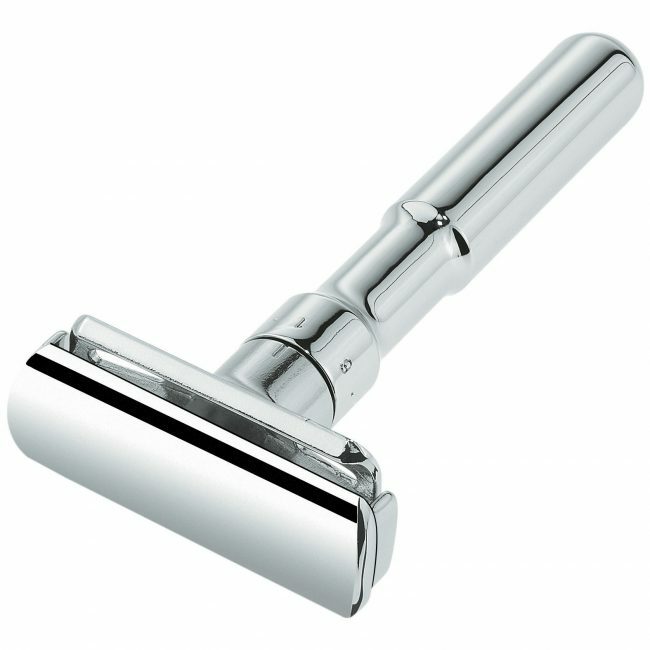 Its long handle also features an etching for a more comfortable grip when shaving. Like I said before, it has a wonderful weight for most people but may seem a little heavier for individuals who prefer holding just the very edge of the handle and sliding it around to shave. The good news is that this weight makes better contact between the blade and your face. But again, everything is about preference really. The 38 HD has been a favorite of shavers since time immemorial. As a non-adjustable razor with a small blade gap and head design angle, many have described it as mildly aggressive. Nonetheless, it has been praised for its forgiving touch, especially for newbies. The verdict? It delivers a close and smooth shave without bruises and cuts. With a weight of about 11.2 ounces (58 grams), the Merkur 30C features a light, straight bar head and a matte black handle of about 7.8 cm in length. This three-piece DE Merkur safety razor delivers an extra comfy shaving experience. The shaver is slightly heavy; thus the weight of the head creates an extra smooth shave allowing you to slide effortlessly across your skin. The handle is made from knurled anodized metal providing a sure grip, even with wet and soapy hands. The smooth head of the shaver slides naturally across your face, minimizing irritation while preventing cuts and bruises. 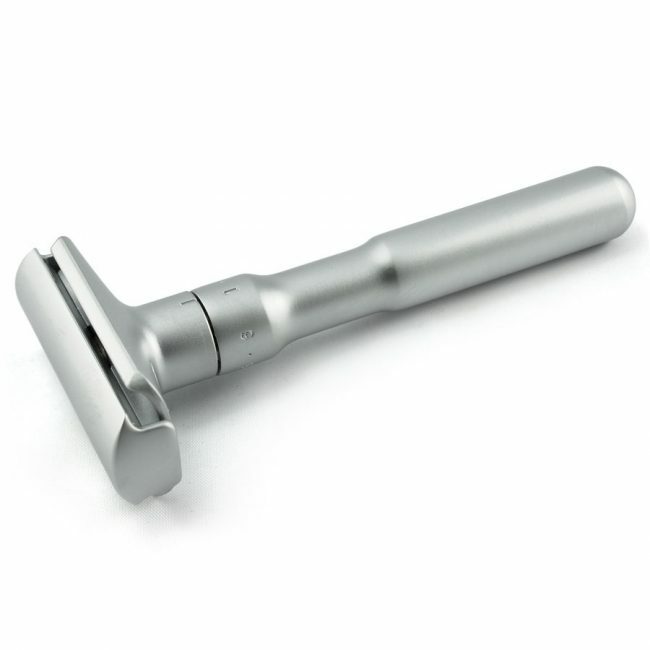 Its delicate construction is comfortably hefty and is, therefore, ideal for men with big hands who want a shorter handle in their Merkur safety razor. Offering great visual charm, functionality, and environmental friendliness, this Merkur steel razor is solidly constructed. If you’re an experienced DE shaver, you can never go wrong with it. This razor is painless — no tugging, no pulling, no discomfort and you can’t cut yourself with it even if you’re a newbie. If you have ultra-sensitive skin, then you’ve just found the solution to all your shaving troubles. Don’t be fooled by those who say that it’s difficult to use it. It isn’t. All you have to do is hold the razor head at an angle to your face then rock it back and forth till you find an angle that shaves to your taste. Just don’t do something stupid like moving it sideways because you certainly might nick yourself. Also, it won’t take more than 20 minutes to do a shave as some people say. Maybe a little closer to that if you are just starting out because you need to be careful. Again, the handle might look slippery, but that’s not the case unless you’re shaving in the shower and it gets all watery and soapy. Guaranteed to leave you with an ultra-smooth skin, you can now say goodbye to razor nicks and bruises. A genuinely worthwhile investment. Taking hold of a Merkur safety razor is the first step towards a comfortable and smooth shaving experience. Using a Merkur requires a more patient and comprehensive approach to shaving. First, you have to prepare your skin well using pre-shave oil. Then effectively open up your skin pores with a warm towel. This can be conveniently replaced by showering just before doing a shave. Before we continue, it’s important to know that a Merkur safety razor makes shaving with any blade easier. It’s a much safer and easy to use a safety razor than a cartridge razor and provides a very comfortable shaving experience despite its blade being more or less like that of an ordinary straight razor. Be it Futur, progress or vision, the blades used in a Merkur safety razor provide an exceptionally close and smooth cut. 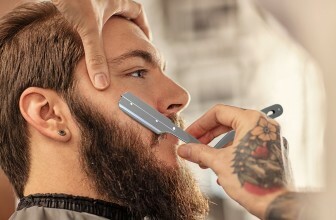 Not only will your skin receive a close and neat shave, but the blades themselves are reasonably priced and economical thanks to the razor’s design. The effectiveness of a Merkur safety blade goes beyond a perfect cut to helping you have fewer burns, cuts, and bruises. This is because there is less tension on your skin when you use a safety razor. 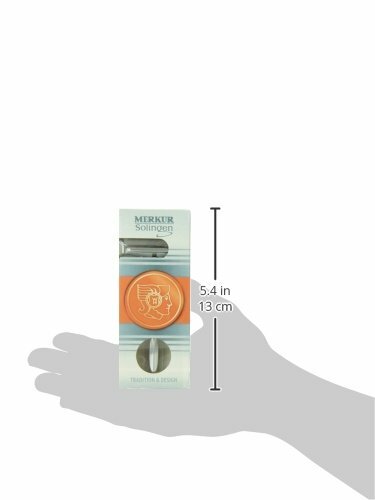 Merkur safety razors further relieve issues such as ingrown hair and razor bumps because of the angle used to cut hair at. Regular razors are shaped to stretch hair and cut at all angles — causing Merkur to be a completely accommodating and well-rounded convenient cutting tool for both newbies and pros. 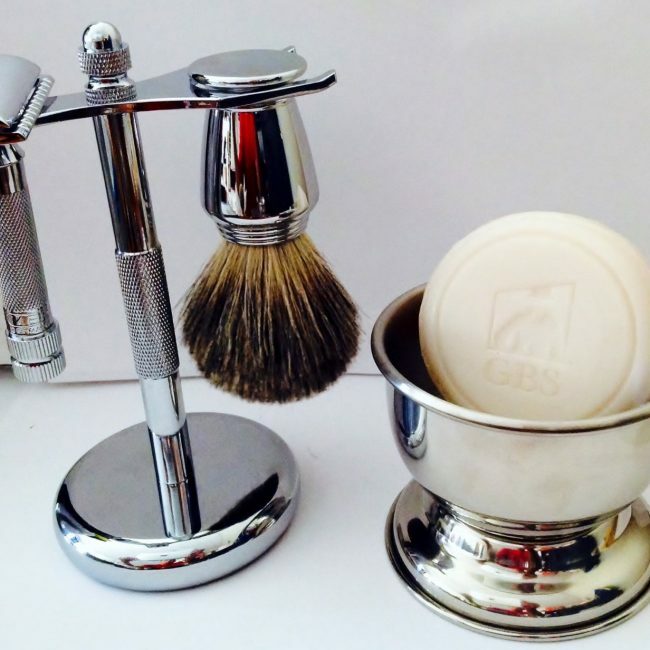 Merkur safety razors look and feel luxurious too. With a Merkur set standing high and mighty in your bathroom, you instantly convey a message that you’re serious about shaving — and can go a long way to ensure you get the best shave using the best products. Merkur offers a wide array of color choices too, which is why you impact the versatile and colorful world without trying too much. Men feel proud using a Merkur safety razor, and their affordable price also makes a great gifting choice for anyone that you know who may want a change in the way they shave. Should You Buy a Safety Razor? 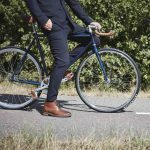 There are countless reasons as to why you should start using a safety razor. Regardless of experience, any guy can start using a safety razor. Not only can you get a smooth shave, but you can also save some money. Here are more reasons to why you should embrace safety razors for a closer, more comfortable shaving experience. Getting a good safety razor doesn’t mean that you’ll have to part with an arm and a leg. You can easily find a great one at $30 or $40 maximum. If you think that’s a little too much to part with, then you haven’t heard how much razor blades cost. For instance, 100 Merkur razor blades go for $10. And this is considered among the most expensive blades). This means that one blade goes for $0.10. Now, feel free to check how much you paid for a cartridge for your blade vibrating ultra-razor. Without a doubt, replaceable blades are much cheaper compared to many other options including cartridges. But that’s not the only reason. Most safety razors are made using materials that, when well maintained, could last forever. Sadly, the same can’t be said about cartridge razors nowadays. You’re probably already familiar with this. The fewer blades there are on a razor, the faster and deeper it cuts your hair and the less irritation you get. But imagine using a cartridge razor with five blades. With every pass, you have five blades cutting across your face. Here’s why safety razors are the better option. You only use one blade, which is very sharp by the way. With each pass, it cuts all your facial hair deep enough that you don’t need to go back and forth the same area. As a result of this, you reduce the amount of disturbance on your skin thus you’ll have less irritation. 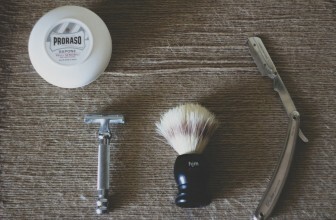 Besides the blade, the shaving method between a safety razor and a cartridge differ. With a cartridge razor, you have to apply a lot of pressure on your face to have a close shave. You might even have to repeat the cut a number of times even when your face is unlathered. When you use a safety razor, you’re naturally forced to apply less pressure since you need to be very careful. Additionally, you can’t have a nice shave unless you lather up well. Therefore, you’re somewhat required to be extremely careful, and this allows you to have a smooth shave that won’t cause any irritation. One of the main reasons for acne is the excess build-up of dirt and oil within the pores of your skin. Having to live with acne is unpleasant. However, a safety razor can help you handle this situation a bit easier. When you use a cartridge blade, you have about five blades going over your skin. When there are a lot of blades going over your skin, they start to fill up your freshly cut skin with oils and dirt from shaving. Due to this, you can have a flare up of acne after shaving. The opposite is true with a safety razor. First and foremost, the fact that it is extremely sharp means that you’ll have to go over the same area of skin a maximum of two or three times. With this method, you considerably reduce the number of times your skin gets irritated by shaving. Moreover, without any blockage and clogging on the blades, there’s fewer bacteria floating on and around the blade area. This reduces the chances of filling your freshly cut skin area with dirt and oils. So, in short, if you want to lessen the risk of contamination from dirt and oil when using a cartridge, you’ll have to purchase new cartridges on a frequent basis. This has proven to be a very costly undertaking. Luckily, all the frustration can be quelled by using safety razors. Shaving with a safety razor gives you such a deep, smooth and close shave that you would never achieve with a cartridge razor. This is partly due to the sharp nature of the razor blades as well as the fact that a safety razor is much more bare and exposed than a cartridge razor. If you look more closely, a cartridge razor has its blades boxed, and this is why you never feel the aggressiveness of the blades when you pass them across your skin. If you want a close shave with a cartridge razor, you’ll have to apply a lot of pressure on your face. Luckily, the same cannot be said for a safety razor. They are already extremely sharp. Now with just two or three passes, you can be assured of an effortless, smooth and close shaving experience. The result is a vibrant, smooth face without cuts, bruises or irritation. What else could one ask for? To avoid razor burn, you should have a clean and sharp blade. This is where most cartridge razors fall short. They are very susceptible to clogging and when clogged, bacteria multiply and then boom, you get razor burn. A safety razor is a more effective solution since it helps reduce bacteria based on the number of blades and sharpness of the razors. Competition — Which One Is the Best among Reviewed and Why? 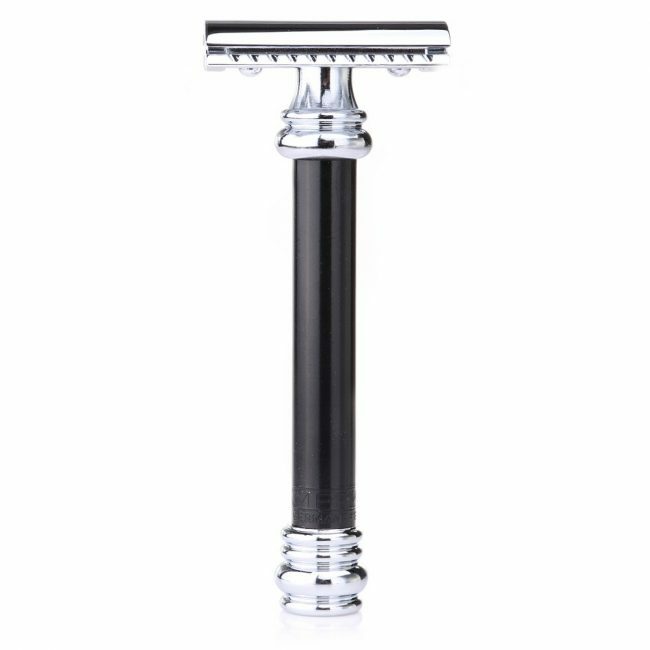 With a weight of about 11.2 ounces (58 grams), the Merkur 30C black double edge safety razor takes the #1 in this category. It features a light, straight bar head and a matte black handle of about 7.8 cm in length. This three-piece Merkur safety razor delivers an extra comfy shaving experience. The smooth head of the shaver slides naturally across your face, minimizing irritation while preventing cuts and bruises. 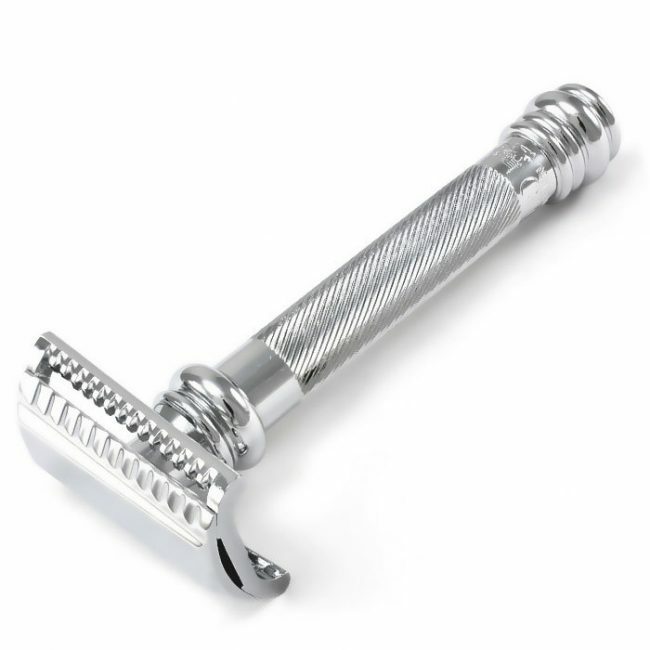 Its delicate construction is comfortably hefty and is, therefore, ideal for men with big hands who want a shorter handle in their Merkur safety razor. Offering great visual charm, functionality, and environmental friendliness, this Merkur steel razor is solidly constructed. If you’re an experienced DE shaver; you can never go wrong with it.